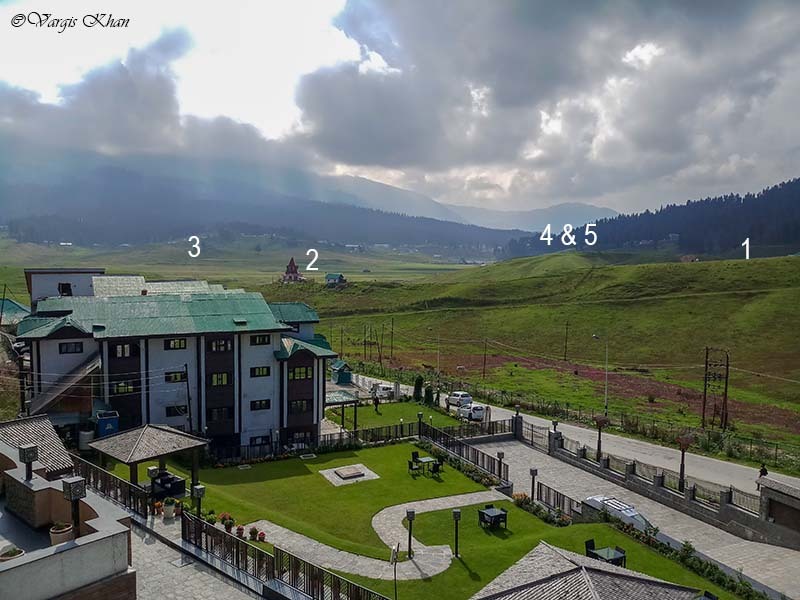 Continuing next in the Gulmarg travel guide series, in this article I will provide some information on tourist attractions in Gulmarg and its nearby areas. To be honest, natural beauty and vistas capable of leaving you mesmerized is what the main attraction of Gulmarg is. It is one of the top tourist destinations of our country; and thousands of people flock here each year to spend some time in the lap of Mother Nature. The calm of the place and its meadows will leave you wanting to stay here for as long as you could. Come winter, it turns into the most famous ski resort of our country. Just about everything about this little town is beautiful. With that being said, there are a few spots here that deserve a mention and a visit definitely; places that can be considered as of interest for people visiting. I was recently in Gulmarg and spent a couple of days there exploring as much as I could. One of the biggest confusion I had before I went there was how much time did I need to spend in Gulmarg to see it all. If you too were wondering the same, then hopefully after reading this article you will have an answer to your question; and will be able to plan your journey better. So let me first begin by listing down places of tourist interest in Gulmarg town itself. Without any doubt, a Gondola ride is by far the biggest tourist attractions of Gulmarg. It not only draws tourist here from other parts of the country but even from Kashmir itself. The cable car brings tourists from Gulmarg to the top of Apharwat peak and the views that it offers of other snow capped peaks and the valleys is definitely worth the journey. I have discussed Gulmarg Gondola in details in a different article; How to Plan Your Gulmarg Gondola Ride. This lake is also known locally as Frozen lake due to the fact that it freezes completely in winter season. It is situated at the top of Apharwat Peak and is about 1 hour steep walk from the point where Gondola Phase 2 drops you. It is about 3 kilometers only but will definitely take it out of you due to the steep climb. To know more, please read How to Plan your Trek to Alpather Lake. Apharwat Peak is a summit, situated at a height of 4,390 meters (14,403 ft) above the sea level. It receives heavy snowfall and remains covered with snow for much of the year. The Line of Control (LOC) is barely a few kilometers away from here. The peak is actually visible from everywhere in Gulmarg. It is just the biggest mountain right in front of your eyes. You don’t even need to go anywhere or plan a trip here separately; as the Gondola ride itself is all about climbing up the Apharwat peak. Also known simply as Rani Temple, the temple was built by Maharaja Hari Singh and is dedicated to Lord Shiva. It is named as Maharani temple because the queen Maharani Mohini Bai used to perform prayers here everyday. The most extraordinary thing about this temple however is that the priest here is actually a Muslim, Ghulam Mohammad Sheikh. Yep, you read that right !!! It is considered as one of the highest golf courses in the world. The entry is free for tourists. You can just walk through the golf course and for Rs. 300 per hour, you can even play some golf here. The workers at the Golf Club will be more than eager to have you come and play. This beautiful church was built here in Gulmarg during the British rule in India. This Victorian Architectural Wonder is located quite close to the Golf course and Maharani temple. This palace was built by Maharaja Ranbir Singh of Kashmir and was once his residence. It is now open for tourists for a nominal fee. There are some ancient weapons on display inside the palace which are worth seeing. OK so this is not really much of a tourist place. It is actually just a children’s park but is located in the meadows and is quite beautiful. The entire set up of the park actually is quite calm and peaceful making it great for a small walk. When I heard about it first, I had really high hopes for this place but it turned out to be a complete disappointment. This is not actually a valley or anything but just a part of Gulmarg where there is a small strawberry plantation. Even the plantation is alive during winter season only; rest of the time it is just a bunch of dried up plants, nothing more. There is a camp site here though by the name of Gulmarg Meadows. So if you are interested in camping and want to stay a bit out of main Gulmarg town then go to Strawberry valley. Else, you may as well just skip it. So that was your list of all the tourist places in Gulmarg. Now let me show you how and where are these located. See that huge ground in the picture above? This is actually the Gulmarg Golf Course and the entire town is around it. No matter where you stand in Gulmarg, you will be seeing this view. Now # 1 spot in the picture is where Maharaja Palace is, 2 is the Maharani temple, 3 is the St Mary’s church. Hiding behind that small hill and about 3 kilometers of walk away are the children’s park and Strawberry valley marked as 4 & 5. So yes, you will be seeing the Gold Course all the time anyways and you can walk around it in 2 hours to see rest of the tourist places. Now let me talk about some tourist places that are not really in Gulmarg but in the nearby areas. The shrine of Sufi Baba Reshi is one of the most famous and visited shrines in all of Kashmir. It is a beautiful dargah located about 5 kilometers away from Dargarh. You can actually visit it either while going to Gulmarg or while coming back to Srinagar. A road bifurcates towards the shrine a little after Tangmarg from where it is about 4 kilometers away. To know more about it, please read The Life and Legend of Baba Reshi. It is located near Phase 1 station of Gulmarg Gondola; also known as Kungdoor station. You will have to walk a few of kilometers though to get here. These are a couple of water streams near Gulmarg. These are however a few kilometers away and the best way to reach would be a pony ride. Walking all the way will definitely get tiring for families. 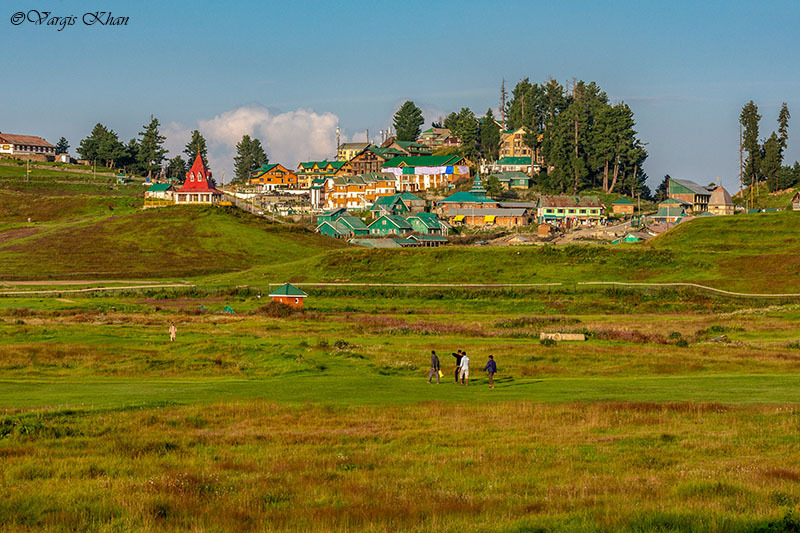 Now out of the above, If I was to name must visit places that my choice would be Gulmarg Gondola, Maharani Temple, St. Mary’s Church, Golf Course. If you don’t mind walking a little more then you can also include Maharaja Palace in the list. For the ones who are fit enough to trek and climb a little, then a trek to Alpather Lake will top this list. You can skip Strawberry valley, the nallahs, Khilanmarg and children’s park etc if you were short on time. Nothing too special about these places. Two days is all that you really need to see all that there is to see in Gulmarg. If you have more days in hand then by all means, do stay for a day more. But 2 days is the minimum that I will recommend. Arrive here on Day 1 and just walk around seeing all the places I numbered in the picture above. On Day 2, go for Gondola ride, trek to Alpather lake and come back to Gulmarg. On Day 3, wake up early and walk to Strawberry valley, Children’s park and Maharaja palace. You will be back to your hotel in 2-3 hours after which you can check out and be on your way. I hope the information above on tourist attractions in Gulmarg was of help. If you have any other questions; or need any other details; please feel free to ask in the comments section below; or at our Community Forum; and I will be gad to answer. If you have been to Gulmarg and know of a place that I missed in the list, please be kind enough to comment and mention it.